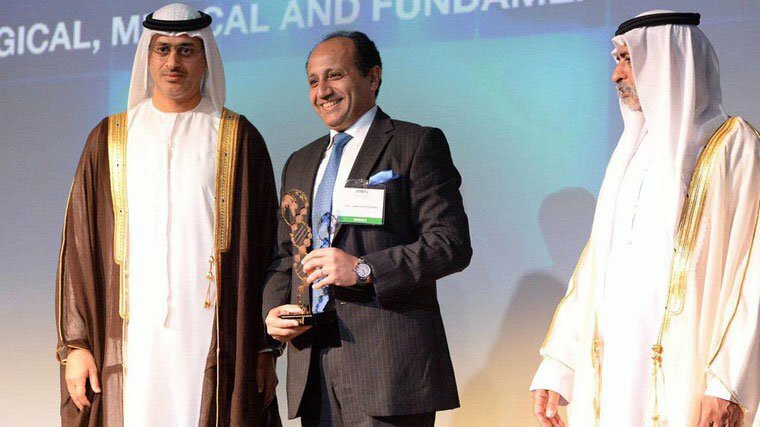 We would like to congratulate one of our researchers, Professor Ahmed, for receiving an `International Scientist of the Year' award from the United Arab Emirates Genetics Diseases Association (UAEGDA). The award is to recognise his group's recently published work on genomics, screening and metastasis of ovarian cancer. The work carried out by Oxford University researchers made two important discoveries that offer hope for managing ovarian cancer; a way to detect ovarian cancer early, and the identification of an enzyme that is key in making ovarian cancer more deadly. The award was presented by His Royal Highness Sheikh Nahyan Al Nahyan, UAE Minister of Youth and Culture. You can read more about Professor Ahmed's research on ovarian cancer here.